A few of you were asking me to tell you about how our "Little Christmas" celebration went yesterday, so I thought I'd share it with you today. Last night we had the privilege to join some friends for family night. I have a dear friend Ingrid who invited a few families from church over to her house. She's from Mexico and her family wanted to share some of their holiday traditions. We went over for a "Little Christmas" celebration. Instead of celebrating Christmas on the 25, by opening gifts and such, they wait till January 6 and celebrate when the wise men came to see Christ. So instead of Santa bringing gifts, the wise men bring them instead. It was so fun to see her kids shouting "look what the wise men brought". They were so excited! We also all shared a cake/bread that had been made. It was kind of like a cinnamon roll, but not since it was like a dry cake. It was a mix between the two. If that makes sense at all. I know I'm describing it horribly. It was in the shape of a circle, which symbolized the unending love God has for us. The candies on the cake represent the jewels the wise men wore. In the cake were a bunch of tiny baby Jesus. The tradition is that if you get a baby in your piece of cake, then you're responsible for making tamales the following week. The kids were all looking for babies in their slices. Keagan actually got one! I'm so thankful for good friends that opened up their home and taught us about a tradition from Mexico. Spending time with friends and families was exactly what we needed yesterday. I love that tradition! 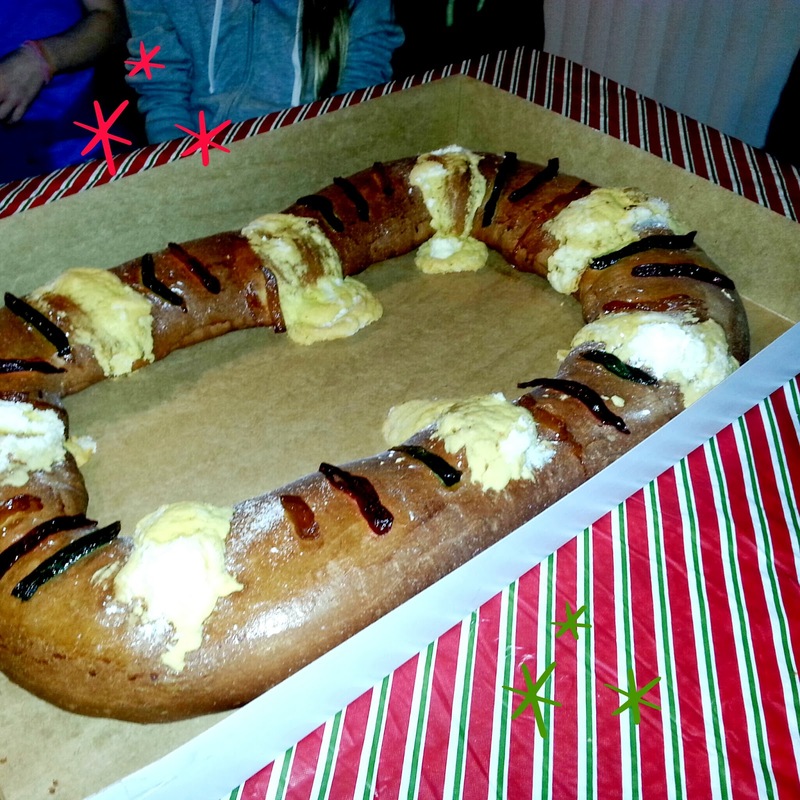 I love the way Latinos celebrate Christmas! What a lovely experience for you and your family. Neighbors like that are the Bedt! Very cool. My Grandma is Catholic and she said it sounded like something she celebrated as a kid as well. Hey Danielle! I sent you the email with my guest post in it quite a while ago. I never saw it posted and I never heard back from you. I sentt you an email to make sure you had received it, and I never got an answer. I was wondering if you got it? And now I know why some religions celebrate Christmas a week or two later....it's all about the 3 king! My good friend is Serbian and they're Russian Orthodox and I never understood why they celebrated late. Interesting! Actually...I kind of like the three kings bringing gifts better than Santa Claus. Yes the kings bringing the gifts is my favorite part. Spanish people also eat a special cake as well and it is a lot of fun to see who gets the piece with a small king (receives good luck for the year) or a small bean (has to buy the cake the following year). I have gotten the bean the last two years! Cutting "la rosca" is always fun and a wonderful tradition! We have many rich traditions such as celebrating children in April. Yes thats what its called. I couldn't remember the name of the cake. Sharing traditions with friends...what a lovely FHE! We had it wiwithh a cinnamon hot chocolate. It was yummy! That is so neat! I learn something new everyday :) good times!